The Scuderia Ferrari team did not only have Tazio Nuvolari as a ace in hands but also the beautiful car Alfa Romeo Monoposto tipo 8 C. The 3.8 litre produced 330 bhp. 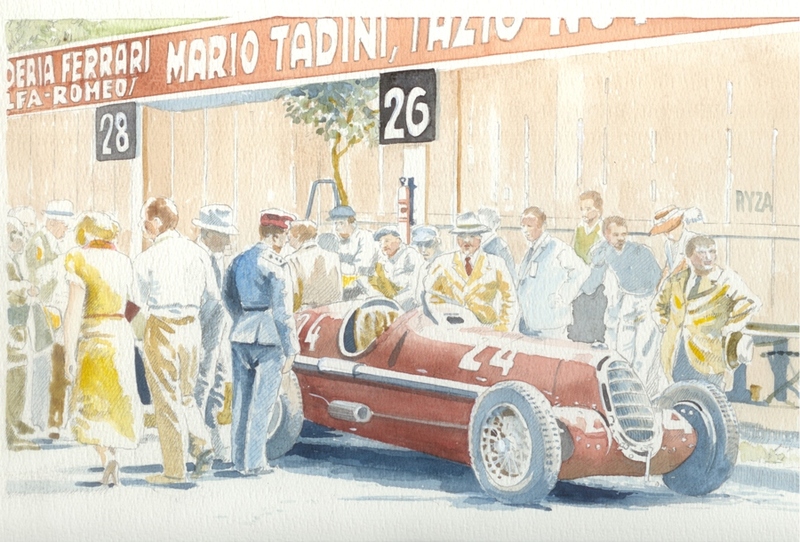 The car made its debut at the Italian Grand Prix in September 1935. The Scuderia Ferrari team was founded by Enzo Ferrari in 1929 and became the racing team of Alfa Romeo, building and racing cars under the Alfa name. In 1938 Alfa Romeo management made the decision to enter racing under its own name, establishing the Alfa Corsa organisation which absorbed what had been Scuderia. Enzo Ferrari disagreed with his own name for a period of four years. In 1939 Ferrari started work on a racecar of his own, the Tipo 815 (eight cylinders 1.5 l displacement). The 815 was thus the first Ferrari car. World war II put a temporary end to racing and Ferrari concentrated on an alternative use for his factory during the war years, doing machinetool work. After the war Ferrari recruited several of his former Alfa collegues and established a new Scuderia Ferrari which would design and build its own cars. The prancing horse was het symbol of Italian world war I ace Francesco Baracc’s fighter plane and became the logo of Ferrari.